What are black peppercorns? About the ingredient black peppercorns. Including 279 recipes with black peppercorns, nutrition data, and where to find it. Black pepper is produced from the still-green unripe drupes of the pepper plant. The drupes are cooked briefly in hot water, both to clean them and to prepare them for drying. The heat ruptures cell walls in the pepper, speeding the work of browning enzymes during drying. The drupes are dried in the sun or by machine for several days, during which the pepper around the seed shrinks and darkens into a thin, wrinkled black layer. Once dried, the spice is called black peppercorn. Black peppercorn is considered spicer than white peppercorn. It is quite surprising that the use of pepper has come so much into fashion, seeing that in other substances which we use, it is sometimes their sweetness, and sometimes their appearance that has attracted our notice. Pepper loses flavor and aroma through evaporation, so airtight storage helps preserve pepper's original spiciness longer. Pepper can also lose flavor when exposed to light, which can transform piperine into nearly tasteless. 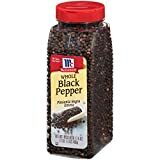 *Once ground, pepper's aromatics can evaporate quickly; most culinary sources recommend grinding whole peppercorns immediately before use for this reason. More detail Order now to save $0.29! More detail Order now to save $1.50! Black peppercorns are usually found in the spices section or aisle of the grocery store or supermarket. Black peppercorns are a member of the Spices and Herbs USDA nutritional food group. How much do black peppercorns weigh? There are 280 recipes that contain this ingredient.